OUR MOON IS SOLID, NOT transparent. So it is impossible for a star to appear between the points of a crescent moon. But ancient artists did not care about this, even if they understood it. Because the orbits of the Earth, the Moon and the planets all lie in nearly the same plane, a bright planet or star can appear very close to the Moon (what astronomers call a “conjunction”) or even be eclipsed by it (an “occultation”). Living in a world without electric lights, most ancient people were much more familiar with the night sky than we are, and the stars and planets were very important to their view of the universe. Many believed that events in the sky were closely linked to events on earth; a belief that developed into the pseudo-science of astrology. In Sumerian cuneiform writing, a star and crescent is the ideogram for “incantation” or magical spell. In Egyptian hieroglyphics, a star below a crescent forms the symbol for “month”. The Nebra sky disk, a bronze artifact inlaid with gold and dated to c. 1600 BCE, is one of the earliest representations of a crescent and stars in Western art. Found in Germany in 1999, its purpose is uncertain. At least four different Greco-Roman goddesses had a lunar connection: Hecate, Selene, Artemis (Diana), and Aphrodite (Venus). The star and crescent appears as a powerful symbol with many meanings, and it is often found on ancient coins. Head of Athena to right, wearing crested Attic helmet adorned with three olive leaves and palmette, round earring and pearl necklace. Rev. 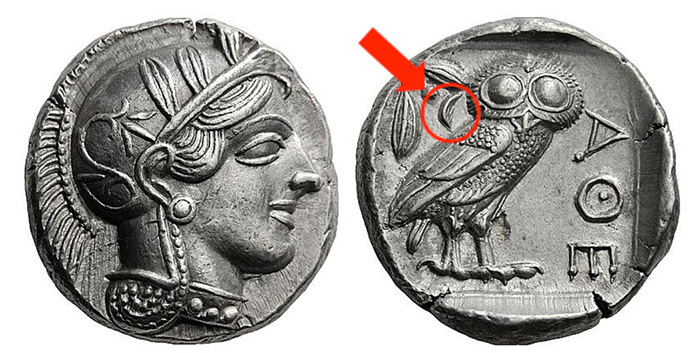 ΑΘΕ Owl standing right, head facing; behind, olive spray and crescent moon; all within incuse square. Cf. Dewing 1594 and Svoronos pl. 14, 3 . A splendid coin with a wonderful archaizing head of Athena. Minor flan fault in the reverse field and some minor marks, otherwise, virtually as struck. The best-known crescent moon on an ancient coin is a small symbol behind the shoulder of the owl on the reverse of the silver tetradrachm of Athens, a popular trade coin accepted for centuries and widely imitated across the Mediterranean world. The crescent first appears on the coins shortly after Athens’ victory at the Battle of Marathon, fought beneath a waning moon (August or September 490 BCE). The crescent may also recall the crescent formation of the Greek ships at the decisive Battle of Salamis (September 480 BCE). Tarentum Trihemiobol (Silver, 0.78 g 2), c. 450-380. Diphros, or table with four legs, with two pellets on top. Rev. Distaff between two eight-rayed stars; below left, crescent to left. HN III, 855. Vlasto 1200. Rare. 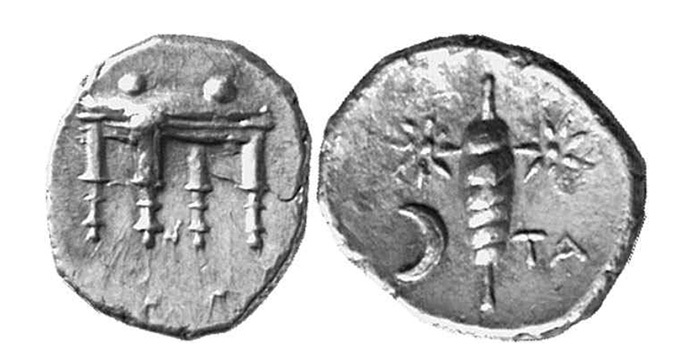 Tarentum, a prosperous Greek city on the heel of the Italian “boot”, issued a tiny silver trihemiobol (0.78 g) c. 450 – 380 BCE showing a distaff (a tool used in spinning thread, symbolic of the local wool industry) between two stars and a crescent. In a 2005 Swiss auction, this rare piece realized $705 USD. 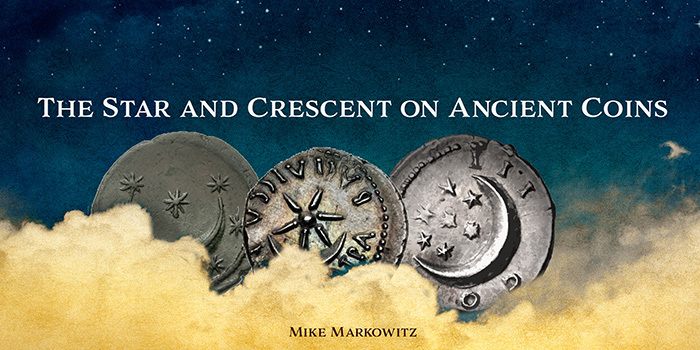 On the more common and even tinier hemiobols of Tarentum (c. 325 – 228 BCE), stars and pairs of crescents, back to back, are the only designs on both sides of the coin. The small town of Uranopolis (“sky city”) in Macedon was dedicated to the sky goddess Aprhrodite Urania. On its bronze coins (c. 300 BCE), the goddess appears seated on a celestial globe. The star and crescent are depicted on the reverse, in a pattern that will be repeated on coins for centuries to come: the “horns” of the crescent point upward, and the star is a pellet with six or eight rays. The Greek city of Byzantium (which would become Constantinople in 330 CE, and, Istanbul after 1453) adopted this symbol on its coinage in the first century BCE. According to legend, in 340 BCE, when Philip of Macedon (father of Alexander the Great) besieged Byzantium, the appearance of a sudden light in the sky warned the defenders in time to prevent a surprise night attack on the walls. In gratitude to the lunar goddess Hecate, the city placed a star and crescent on its local coinage. This custom continued well into the Roman era. A striking bronze uncia of the Roman Republic, c. 217 BCE depicts Sol, the sun god, with his crown of rays on the obverse and a crescent with a pellet and two stars on the reverse. To modern viewers, this is amusingly familiar as a “happy face”, but ancient Romans might not have made the same association. L. Lucretius Trio. Denarius, 76 BCE. AR 3.93 g. Radiate head of Sol r. Rev. L. LVCRETI / TRIO Crescent surrounded by seven stars. Cr. 390/1. Syd. 783. Seaby Lucretia 2. The combination of an obverse image of Sol with a star and crescent reverse appears again on a silver denarius of 74 BCE issued by L. Lucretius Trio. On this coin, seven stars accompany the crescent. The most visible cluster of seven stars is the Pleiades, important to ancient peoples because its appearance above the horizon marked Spring planting and Autumn harvest seasons. Occultations of the Pleaides by the moon occurred in October and December of 75 BCE, and would have been noted by Romans of that time. The design with just five stars appears again on silver (and rare gold issues of P. Clodius Turrinus) on 42 BCE. KINGS of PONTOS. Mithradates VI Eupator. Circa 120-63 BC. AV Stater (20mm, 8.46 g, 12h). Amisos or Sinope mint. Struck circa 93/2 BC. Diademed head right / BAΣIΛEΩΣ EYΠATOPOΣ, star above crescent within ivy wreath. Callataÿ p. 4, dies D1/R1, a = SNG von Aulock 5 = G. Kleiner, “Pontische Reichsmünzen” in IstMitt 6 (1955), pl. 1, 6 (this coin); HGC 6, 331 (this coin illustrated); SG 7246 (this coin referenced). Good VF, lightly toned, scrape on obverse, obverse double struck. 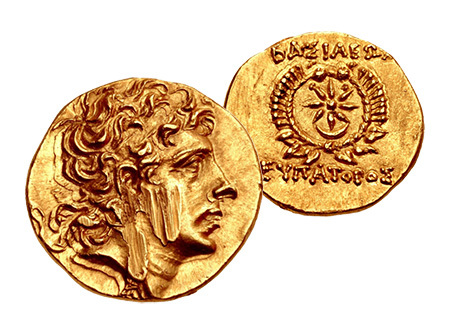 Unique, and the first gold stater of Mithradates’ reign. In 119 BCE another comet appeared, when 15-year-old Mithridates deposed his mother and seized the throne for himself. The star and crescent was the badge of his dynasty and it appears consistently on his coinage. A large star and crescent surrounded by a wreath forms the reverse of a unique gold stater of c. 93 BCE. On his abundant silver coinage, the star and crescent appears on the reverse as a small symbol beside a stag or Pegasus. Defeated in battle repeatedly by Roman armies, and faced with a rebellion by his own son, Mithradates killed himself in 63 BCE. The kingdom of Mauretania, in what is now Morocco, Algeria and Tunisia, became a Roman client state in 27 BCE. King Juba II (c. 52 BCE – 23 CE), who had been raised and educated as a royal hostage in Rome, married Cleopatra Selene II (40 BCE – 6 BCE), daughter of Cleopatra and Mark Antony. A silver denarius of Juba bears his portrait on the obverse with a Latin inscription, and a star and crescent on the reverse, with the Greek inscription “Queen Cleopatra”. Since Selene was a moon goddess, the symbol is a reference to her name. Many Roman emperors took astrology seriously; some even employed court astrologers. 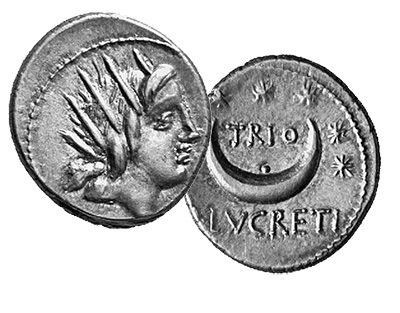 Beginning with the first emperor, Augustus, the crescent symbol with one or more stars appears repeatedly on the coinage, probably at times when significant lunar events were observed and taken as favorable omens. Augustus. 27 BC-AD 14. AR Denarius (3.92 g, 3h). Rome mint. P. Petronius Turpilianus, moneyer. Struck 19/8 BC. CAESAR AVGVSTVS, bare head right. TVRPILIANVS • III • VIR •, six pointed star above large crescent. RIC I 300; RSC 495; BMCRE 32-4; BN 161-6. A denarius of Hadrian c. 127 CE, shows the star and crescent above a pellet, another c. 128 CE shows the crescent with the familiar cluster of seven stars. Because the moon was associated with various goddesses, the symbol also appears on coins of empresses, notably a posthumous bronze honoring Faustina (died 141 CE), the wife of Antoninus Pius. CNG Triton V auction, 15 January 2002, Lot 7. Realized $475. New York Sale III, 7 December 2000, Lot 417. Realized $350. Some sources date this coin to 76 BCE. New York Sale III, 7 December 2000, Lot 577. Realized $180. NAC Auction 100, 29 May 2017, Lot 374. Realized $56,480. CNG Auction 100, 7 October 2015, Lot 64. Realized $19,000. Roma Numismatics Auction 7, 22 March 2014, Lot 746. Realized $9,896. CNG Auction 100, 7 October 2015, Lot 1616. Realized $280. CNG Triton XI, 8 January 2008, Lot 701. Realized $2,800. Roma Numismatics E-sale 37, 24 June 2017, Lot 419. Realized $405. 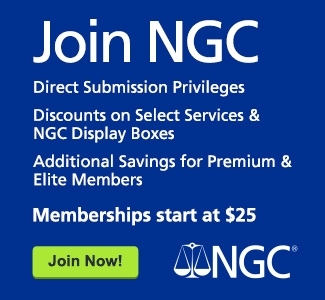 CNG Electronic Auction 264, 21 September 2011, Lot 413. Realized $380. CNG Auction 63, 21 May 2003, Lot 1369. Realized $600.